Every now and again I see a comment from one of the staff members on Facebook proclaiming Cape Town Tourism as a "dream team" and I think, "Here we go with another mutual admiration society!" But then I engage with Mariette du Toit-Helmbold, CTT’s CEO, and I realise that it will never happen simply because she is so grounded. She is one of the most responsive and thorough people CapeInfo deals with anywhere. Mariette never ducks a difficult question and for that she has to be respected. Any engagement with her is always positive even if she, as someone once rather cynically commented, "believes all her own PR hype." Well, if you read on, there’s very little hype here. 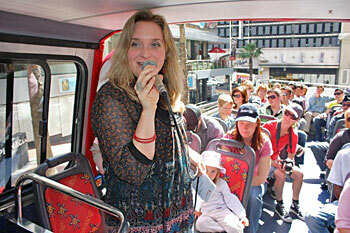 It’s been an exceptionally challenging year for Mariette and Cape Town Tourism. For Mariette, she returned to work from maternity leave in April and balanced her new responsibility as a mother to (now) one-year old Hannah exceptionally well. When she headed off to the World Travel Market in London a month ago, separated from her daughter for the first time, all her Facebook friends must have felt the heartache she experienced. It’s a year in which CTT has become much stronger. It started with the challenge of addressing pricing issues in the lead up to the 2010 WC. CapeInfo carried Lianne Burton’s article on “Make 2010 a love affair, not a one-night stand” which became something of a rallying call. We also worked together closely on CapeInfo’s monthly surveys which brought pricing issues to the fore. Enver Duminy’s first task when he joined CTT was the introduction of a code of responsible conduct. This made Cape Town, along with Knysna, the only two towns I’m aware of that addressed this issue head-on. And then came that splendid month when SA showed that it could host the best FIFA World Cup ever. While the BBC had decided to base itself in Cape Town rather than at the Media Centre in Johannesburg, Cape Town was also filled with other international media. Post-World Cup, CTT were faced with provincial tourism MEC Alan Winde’s published proposal to restructure tourism in the province. This horribly-flawed document and proposal only achieved a 5.8% approval rating from CapeInfo’s readers and nothing to improve on it has come from Winde or his department since. “Research the world over confirms that cities that are great to visit must first and foremost be great to live in. In an age of social networking, citizens are the most effective brand ambassadors, and powerful city brands must always capture the imagination of citizens. Our MY CAPE TOWN programme is no different from I Love New York, I Amsterdam, Be Berlin and numerous other best practice examples. What are the things CTT has done well over the past year? We have made many mistakes and learned many lessons, but we have also achieved much to be proud of. The most significant highlight of the past year has been seeing all the planning for the World Cup fall into place and resulting in a very successful event and the best marketing platform ever for our City. With limited funds available (no additional funding was made available and our grant funding was cut) it was essential for us to identify areas where we could have the most significant impact, and to focus almost exclusively on those. One of the fundamental principles was that cities that are great to live in are also great to visit. E-marketing was a major area of focus and investment with a new Cape Town website launched early in 2009, a dedicated 2010 website, social networking and campaigns – we focused a lot of our attention on using social networking to convert soccer fans into fans of Cape Town. We realized that citizen involvement was critical for a successful event and developed a Citizen Activation Programme launched with one year to kick-off. The result was incredible and we interacted with more than 750,000 citizens in the run up to the World Cup. Cape Town Tourism adopted the official Host City slogan, ‘Cape Town, Ready to Welcome the World’, and devised ways to make it real, for industry and for citizens (via the citizen message, ‘Cape Town. Live It! Love IT! LOUDER!’) and ultimately for World Cup visitors. What could CTT have done better? I can think of many reasons why we could do certain things better, but at the end of the day results are more important than reasons and we have to learn to navigate the complex environment with its many barriers more effectively. Brand in place before World Cup – missed opportunity to introduce and jump-start a compelling Cape Town brand. We tried, but were stopped in our tracks by FIFA and the Host City. We have progressed quite far with this post the World Cup and in fact the event itself has shaped the development significantly. We have shortlisted three positions, which we will now workshop with key partners before selecting the strongest position to implement early in the new year. Post-World Cup Events Strategy – Cape Town 365. The Board of Cape Town Tourism has given the go ahead with implementation. Better alignment with City – communication, strategies, programmes. Engagement with Industry – Future Fit membership programme for Future Fit industry. Cape Town at Large – made a start with 8 Local Area Maps and have built into Visitors’ Guide, now must build these mini brands, especially on website. This is linked to the Legible City project. Marketing in Partnership with Private Sector – MY Cape Town has been very effective, but we now need to build on this. Learned many lessons in terms of partnership marketing and realised we must focus on big business as smaller businesses just do not get joint marketing. SMME Support – development not in our mandate, but yet product development is an essential part of the marketing continuum i.e. market research and customer trends show up gaps which we need to address...but there is a big divide between the development programmes of government and the market. Pricing issue – should have done domestic competitiveness research. Domestic Marketing and growing our Domestic visitor numbers is a key focus in going foward, but more could have been done during the past year. It is an essential aspect in growing the tourism cake for Cape Town and will help address seasonality. Which areas has CTT tackled inadequately? Development of our Visitor Membership Management System (VMMS) has proved complex – it is pioneering work for a DMO and tourism association, but essential if we are to compete on the global arena. We have experienced set-backs and delays, which cost us valuable time and potential additional income over World Cup. We have new partners on board and this project is back on track. Product Packaging and Promotion – this is the single biggest request from trade as identified at the latest WTM. Packaging does not mean only discounts, but must be dynamic. Our industry really struggles to understand and offer the right kind of packages and value for money offerings to trade and customers. Digital Info Network – we have identified transforming CTT into a future fit visitor services model as a key priority for next three years. What are the big thrusts for CTT in the next three years? Cape Town’s World Cup visitors were mainly from traditional key source markets such as the UK and USA, Germany and the Netherlands, but there were significant inflows from new markets, particularly South America and the Far East. We are shifting some of our attention to the new source markets with the focus on media and trade relations in these regions. The world is now mobile and on-line. Tourism has officially been identified as the biggest online market segment, with more than 70% of travel decisions and bookings now being made online. We have invested a lot and learned some hard lessons in pioneering a new technologically savvy tourism infrastructure. We hoped to roll-out a new data-management system before the World Cup, but this proved difficult. Phase one of our new back-end systems is in place with phase two, which will give us access to more data platforms through integration and enable real time reservations, is now in development. We have to balance our reliance on funding with increased self-generated income. Two key commercial initiatives being developed by Cape Town Tourism include a new retail range for Cape Town, designed and produced in Cape Town, and a City Card for visitors, locals and members linked to the City of Cape Town’s new public transport platform. With the World Cup having come and gone, we find ourselves in a brand vacuum. For the last 6 years Cape Town’s status as a host city of the World Cup dominated the brand position and messages. Cape Town Tourism is leading a brand positioning process for Cape Town in partnership with key partners, taking into consideration all the aspects that make our city unique. Events are important platforms for destination marketing, branding and catalysts to counter seasonality. In partnership with the City, we are developing an Events Strategy for Cape Town that looks at a more strategic relationship with existing signature events and establishing or attracting key events within our off peak season. Much debate has taken place on the most effective structure for the future marketing of Cape Town. Tourism must remain apolitical, driven by the private sector and supported by government. We will not compromise Cape Town Tourism’s status as an industry-led association and remain committed to marketing Cape Town and our unique experiences to the world. Have there been problems as a private sector organisation largely funded by local government? The recent debate around the future marketing structure for Cape Town is an example of just how volatile the environment can be and just how important it is to stand firm in our belief in private-public partnership. Is there ever conflict between members’ needs and those of the City of Cape Town? Our status as an industry association is very important. I wouldn’t say there is a conflict, but there are different focus points. Our marketing and visitor services do not just benefit members. We need to provide some kind of regulation and we’ve been asking the City to investigate mandatory registration for some years now. We are looking into a new industry programme that would provide a lower entry level so that most, if not all, tourism businesses can be incorporated. How competitive is Cape Town compared to other long haul destinations? Value is more important than ever before within the tourism sector. In the very competitive global market we cannot afford to be complacent or disregard rumours or accusations of becoming more expensive as merely perceptions with no truth. As a long-haul destination at the tip of the African continent we must retain our value for money status, but guard against selling ourselves as cheap or becoming involved in a price war. The warning signs are there and this is definitely an area of concern for us. Even more reason for us to take the lead and dedicate a lot of our energy to this issue – it is one of our focus points for the next 6-12 months. I do agree that there is an over-supply in top-end accommodation and that Cape Town should look at more mid-range accommodation development. Not many cities have 16 5-star hotels within a 10 km radius of the city centre. What would you like to see from local businesses to be more competitive? Invest in experiences that set you apart from the rest. Offer real value and get your head around what dynamic packaging is. Get to know your customer, he/she has changed. Invest in new marketing especially the eMarketing and Social Networking. Don’t just green wash, invest in real responsible business practices, it makes good business sense. Is CTT the best tourism organisation in SA? We certainly don’t proclaim to be the best in the country, but we work very hard at being relevant and good at what we do. I have always said that “being official will not get people to walk through our doors, we have to be good enough”. We are proud of the fact that our private-public partnership model is viewed as a best practice example by many international tourism leaders – we were invited so serve on both the UNWTO Destination and Business Council and was asked to present at their annual general council both in 2008 and 2009 on CTT’s tourism model. Staying true to our local environment, but in touch with international trends and developments makes us leaders within the South African tourism industry. I would also like to believe that we do not compromise... we like to lead, often facing real threats and get labelled as controversial. Where bureaucratic mindsets dominate, management supersedes leadership and doing things right rather than doing the right thing becomes the norm. Growth is stifled. Seeking safety in the mediocrity of the pack will make us forgettable and irrelevant. Converting World Cup fans into Cape Town fans, and being able to stay in touch with them after they left, was critical to CTT. The I ♥ Cape Town Fan Page currently has over 160 000 active fans... and counting. It is a significant legacy of the World Cup. So, if there are claims of a “dream team” one should put it down to staff exuberance which, if managed, is not a bad thing, especially if they adopt the motto, “you’re only as good as your next success”. The present CTT is now seven years old and ‘Brand Cape Town’ is not as clearly honed as it should be. Models for collaborative and private-public partnerships should have been developed far further. The only thing that will hinder CTT's ultimate success is meddling by politicians. But nonetheless, Mariette has provided outstanding leadership and CapeInfo is willing to bet that CTT is the destination marketing organisation that others – locally and internationally – will watch and start to emulate.